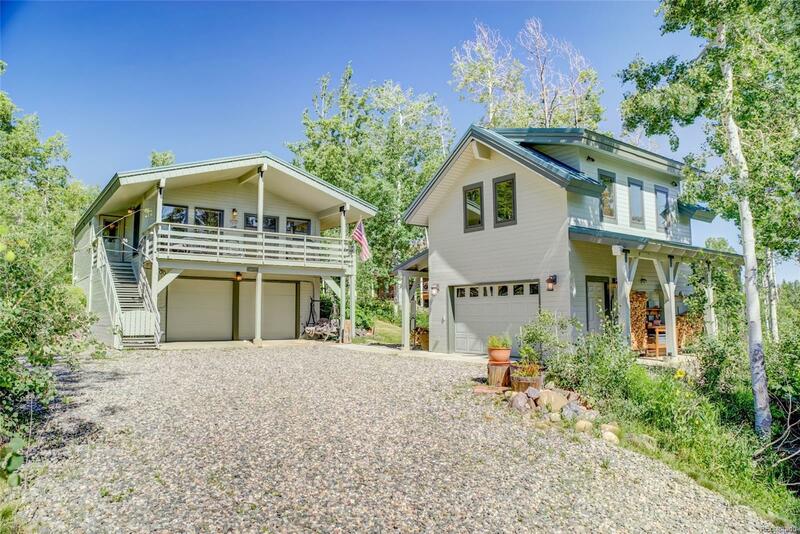 Located in the Steamboat Lake Subdivision, this home is the quintessential cabin in the woods with a private 1,300sf, 3BD main home and a separate studio unit above a detached garage. The main home is nicely appointed with hand scraped hickory floors, oak cabinets, and tongue & groove vaulted ceilings. The upper level includes an open kitchen, dining area, living room, and 2 bedrooms. A large, covered front deck is the perfect breakfast dining room with beautiful views of the Mt. Zirkel Wilderness area. The lower level has an additional bedroom and a spacious 2-car garage. A few steps away is the guest home with an additional garage. Upstairs is a studio with abundant closet space and a 1/2 bath. Currently being used as on office, the room would make the perfect place for a guest quarters with maple flooring, vaulted ceilings, and numerous windows. Only 30 minutes to world-class skiing and downtown Steamboat, this is what you picture in your mind when you think of mountain lifestyle.